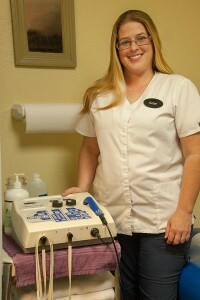 Ultrasound is a therapeutic modality that has been used by physical therapists for over 75 years. Ultrasound is applied by a therapist using a round-headed wand or probe that is put in direct contact with the patient’s skin. Ultrasound gel is used on all surfaces of the head in order to reduce friction and assist in the transmission of the ultrasonic waves. A typical ultrasound treatment will take from 3-5 minutes depending on the size of the area being treated. Some conditions treated with ultrasound include tendonitis, non-acute joint swelling, muscle spasm. This is an application used to decrease inflammation and internal swelling. It also aids in speeding up the healing process and pain relief.